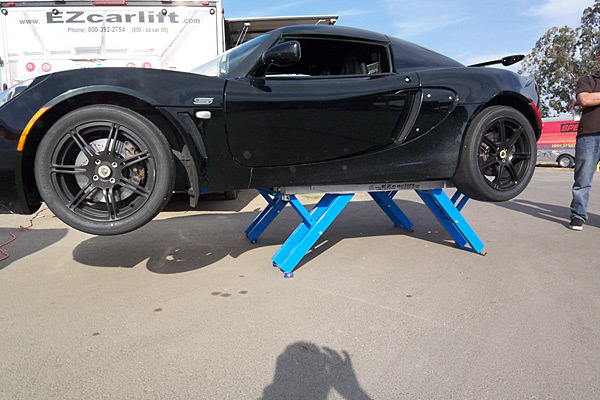 LotusTalk - The Lotus Cars Community > Community > Garage Majal > Nice garage lift option! I've been looking to get a simple, portable, and compact lift system for my garage and I think I have found it. Anyone have experience with these? Seems like it would be easy to use it trackside too, for wheel and tire changes. You just use a drill to raise and lower it! 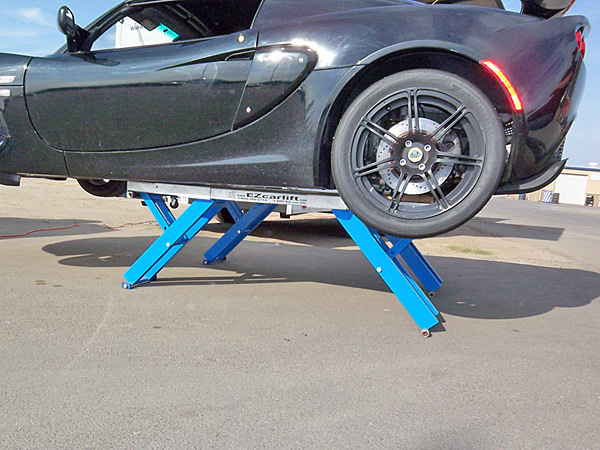 EZ CAR LIFT - FREE-STANDING USE-ANYWHERE CAR LIFT! FAST. SAFE. STRONG.EASY. Last edited by Shawn C; 05-30-2011 at 11:27 AM. I have read they will do group buy pricing if anyone is interested? Wheel and tire, Brake and Oil Changes would be a snap with this thing. So am I. I find changing all 4 wheels on my Elise/Exige at the same time, the most difficult and frustrating part of owning this car. None of those images have the undertray removed. Curious to know how that would work. But interested. I am interested in a group buy if the undertrays can come off with this on. Any pics if the underside of the car while lifted? Edit: It's been discussed before! Last edited by loki007; 05-30-2011 at 05:17 PM. 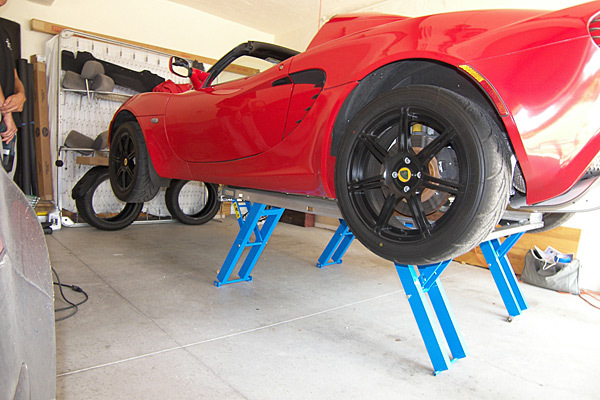 I checked this product while exploring car lift alternatives for my garage. Overall, I like the product concept and execution, but I think its value proposition makes no sense given the price point and broader functionality of other alternatives. I'd be all over it if it were around $1,000, but at close to $2 grand there is no way. I don't like how the car is sitting on that lift. It doesn't look like its hitting any of the jack points. Looks more like its sitting on the center of the chassis witch i don't think is good. I also don't think those are optimal support points for that lift. check out the video below, i think it is just how that car is sitting on the lift, looks like it would be just fine if they had positioned it porperly. i really like this solution but 2k is way too much for is essentially a screw lift. I would pay maybe 1200? for it but I agree 1700 is too much. You guys always looking for extra space would probably like this too. Last edited by Shawn C; 05-31-2011 at 05:08 AM.